From the title of this movie I had expected a courtroom drama, but actually the trial and opposition that screenwriters Lars Kraume (also the director) and Olivier Guez are describing is far more pervasive and insidious. For they take us to West Germany in the late 1950s and 1960s where the government and state institutions are still populated with former Nazis and it’s in no-one’s interest to expose their former crimes. This even goes for the US government that needs a strong West Germany as a bulwark against the Iron Curtain. In such an environment our hero is Fritz Bauer - a Socialist, a Jew and a homosexual. The former two are distasteful to the establishment, the latter is a crime that can lead to imprisonment and blackmail. And yet, he is also an excellent lawyer and not without guile. So when he realises that his attempts to bring Nazis to trial are being stonewalled, and that his own staff are stealing files from his office, and tipping off Nazis in hiding, he decides to commit treason. 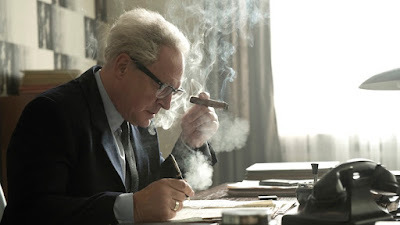 Given a tip that Adolf Eichmann is in hiding in Argentina, Bauer travels to Israel and gives the information to Mossad, assisting their investigation that ultimately leads to Eichmann’s abduction and trial. Once again, this trial is not in Germany, of course. Germany does not ask for extradition. After all, Eichmann may implicate the Secretary of State Globke, and many others. The resulting film is a beautifully acted, well-crafted thriller, who’s concerns are always wide and deep. This film tells us so much about the reality of post-war politics - the need to forget rather than uphold justice. It also tells us about more than just the suffocating silence about political crime. The very social mores are also suffocating, with homosexuals harshly punished and good men brought down through gossip and blackmail. Thank god for a lawyer who thought Germans were strong enough to take the truth - both positive and negative - about their past. This is, then, not just a good film, but an important one. THE STATE VS. FRITZ BAUER has a running time of 105 minutes. The movie played Locarno, Toronto and London and was released in Germany on October 1st.